The school board’s statements and actions (inactions) made during the February 28, 2012 confirmed Florida Family Association’s assessment of victory and further documented that it is highly unlikely that this board will vote to approve a policy that prohibits CAIR officials from addressing students. Florida Family Association issued an email alert on February 23, 2012 which stated that based upon certain facts that CAIR (Council on American Islamic Relations) officials would not be addressing students at Hillsborough County Schools in Tampa Florida anytime in the near future. The Hillsborough County School Board discussed again on February 28, 2012 how to respond to the public outcry over a high school teacher allowing CAIR (Council on American Islamic Relations) officials to make presentations to students. The school board’s statements and actions (inactions) made during the February 28, 2012 meeting confirmed Florida Family Association’s assessment of victory and further documented that it is highly unlikely that this board will vote to approve a policy that prohibits CAIR officials from addressing students. 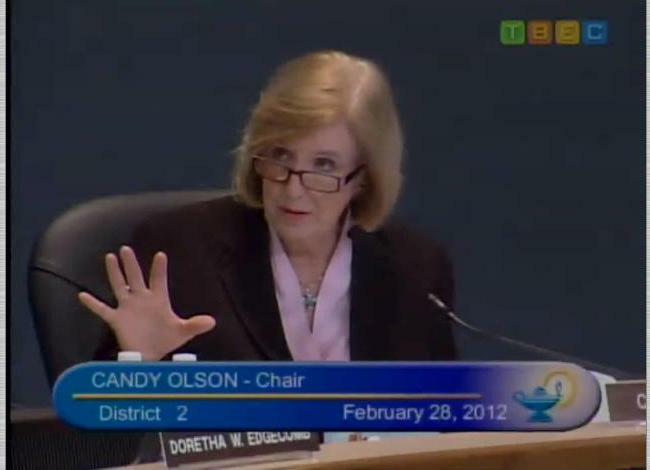 School Board Chair Candy Olson went on record numerous times to make it clear that this “management directive” was “NOT a policy.” She said “I am not at all sure this is a policy. What Ms. Elia and I talked about was a description of what we do.” When Tom Gonzalez, school board attorney, referred to MaryEllen Elia’s “management directive” as policy Board Chair Candy Olson quickly corrected him saying “Not a policy yet.” After which Gonzalez no longer referred to the management directive as a policy. What’s the big deal about adopting a policy for determining who gets to speak to students? Lawsuits for those left behind. Much of what happened at this meeting was a tight legal dance which appears to have been lightly scripted and planned. No motions, no votes. Nothing official and clearly labeling a plan as a "management directive." Nevertheless, Florida Family Association made three more public records requests of specific teachers and board members in this school district on February 28, 2012 and will respond with further action if necessary. Florida Family Association supporters sent over 10,000 emails to each school board member and the superintendent opposing CAIR in public schools. Your emails made a difference.